Editor's note: Nicholas Walton is the communications director of the European Council on Foreign Relations. The views expressed are his own. The first notable dissenting voice came from a familiar figure, that sensible German woman with her reasonable manner and head full of common sense. “Let’s talk,” said Angela Merkel, in response to her British counterpart David Cameron’s speech on Europe, in which he pledged a referendum in the next parliament on whether Britain should leave the European Union. The wider European response to Britain’s perceived wrecking tactics had ranged from scorn to anger; Merkel spoke instead of reaching a “fair compromise” with the perfidious Brits. Although this left plenty of future room for Merkel to be able to twist British arms towards her own Europhile viewpoint, it also spoke to a wider concern about the direction the European project might be taking: while some worry that the Brits are turning away from Europe, others worry that Europe is turning away from the world. Beyond the playing of domestic politics and the residual distrust of Europe that lurks in every Briton’s historical baggage, this was Cameron’s central and most important point: the world is getting vastly more competitive, and if Europe doesn’t adapt to this truth, it may go the way of the Byzantines, the Mayans, and Rome itself. The accompanying point was also important: if Europe wants to adapt to such challenges from the modern world, we Brits will want to be a central part of it. This argument will not have been missed in Berlin or Helsinki, no matter what the initial response to Cameron’s speech was. Although the focus for the EU in the last three years has been saving the euro, the Union is surely a means to greater ends than a currency project. This might be to give Europe global influence in a world tilting towards a G-2 of Washington and Beijing; it might be to forge Europe as a formidable foreign policy and security actor, especially as the U.S. continues its pivot to Asia; and it might be to find a way to harness the collective economic heft of almost thirty nation states rather than leave them to fight individually. On all these counts, an engaged Britain in an EU that faced the world would be invaluable (it would also be invaluable for Britain, as it struggles with debt, a deeply troubled economy and its own declining place in the world). But take security first. Britain sits alongside France as one of the very few European countries that feels comfortable with military matters, as Libya shows. A longstanding American complaint is that Europeans continually fail to take responsibility for their own security, as it seeks to rationalize its own defense and orientate its own capacities towards emerging threats. With economic crisis leading to considerable budget cuts, this situation is only worsening in Europe. Whatever common capacity Europe develops, Britain’s involvement seems necessary to make it credible. In more general foreign policy matters – from diplomacy to the deployment of development aid – the U.K. is already far more involved in Europe-wide affairs than its disengaged image would suggest. In fact, research from European Council on Foreign Relations’ own Scorecard project suggests that the U.K. is up there with Germany and France (and, remarkably, Sweden) as a leader in European foreign policy, on issues ranging from Iran nuclear ambitions to Somalia. Maybe that’s why Barack Obama himself has been nudging Britain to stay in the EU. Economics matters are more complex, and there are doubtless many Europeans, from Paris to Marseilles, who might be pleased to see Britain leave the EU. But despite its own current economic woes the British economic vision of more open, competitive economies is something that chimes in Berlin and several other corners in the northern half of Europe. Without a British counterweight to help balance the more statist economies within the Union, the EU might not be quite as popular in Stockholm and Warsaw. After all, growth is a massive problem in Europe, and one of the core reasons why the euro crisis became so critical (one startling recent figure was that Italy experienced less economic growth in a decade than anyone else in the world other than Zimbabwe and Haiti). This is not to ignore the problems that Britain’s opposition to “ever closer union” could cause the rest of the EU. 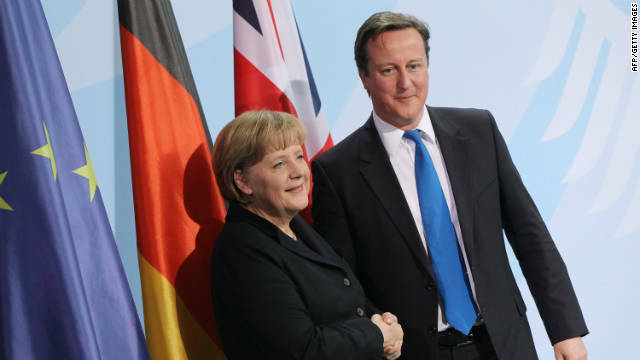 Even Cameron has argued that the eurozone needs to integrate further if it is to survive. And if the euro does not survive the current crisis, any hope of a fighting fit 21st century Europe is probably dead in the water anyway. But Cameron obviously believes that it can survive, and that Britain can help Europe reform and become stronger. All of this will not have escaped Angela Merkel’s notice as she makes her careful calculations. Britain’s recent bumptiousness may grate, and certainly creates extra problems for those already struggling to work out exactly how the sticking plasters currently attached to the eurozone can be converted into more sustainable long term cures. But losing Britain could become something of a nightmare for many other Europeans (provided the price is not too high), and Germany will be crucial in brokering any deal that keeps them in and helps make the EU fit for purpose in the 21st century. A plea for this seems to be the subtext to Cameron’s speech: Britain doesn’t want to turn away from Europe, provided the EU doesn’t want to turn away from the world. The EU is a Fourth Reich, not in how the Nazis envisioned it but in how Germany has conquered much of the whole of Europe by swindling neighboring countries into giving up both their political and economic sovereignties to them. Back when the Euro was being considered leading economists - most notably among them Paul Krugman - told them point blank at the first sign of a massive economic disaster the Euro would create economic chaos throughout much of Europe because the member states that have adopted the currency couldn't print nor mint their own bills and coinage to combat inflation. That exact scenario has played out today. Germany and France are doing their best to try and even keep the Euro afloat. The EU does need Britain. It's the only other economic power capable enough of dishing enough money into the EU to keep the broken system together. The problem for them is that Cameron's government's austerity measures have destroyed the UK's economy as they're teetering on their third recession since 2007. If Britain had adopted the Euro instead of being able to mint their own coinage they'd be in a mess like Italy and Spain are at the moment but not quite like Greece. The best thing for Britain is to get rid of the European Union. Wash their hands of it. Great Britain contributes great benefits to EU, but did not get the opportunity for leadership, until now. The right time is now, to allow Great Britain to show that can lead EU for better future. The unsuccessful EU is not entirely due to faulty German leadership, but mostly, as Germany does not have the necessary knowledge in managing complex EU and Transatlantic relations. Give Primeminister David Cameron and Great Britain this valuable opportunity for leadership.